Social media streams may generate massive clouds of geolocated points, but how can we extract useful information from these, sometimes huge, datasets? I think machine learning and GIS can be helpful here. 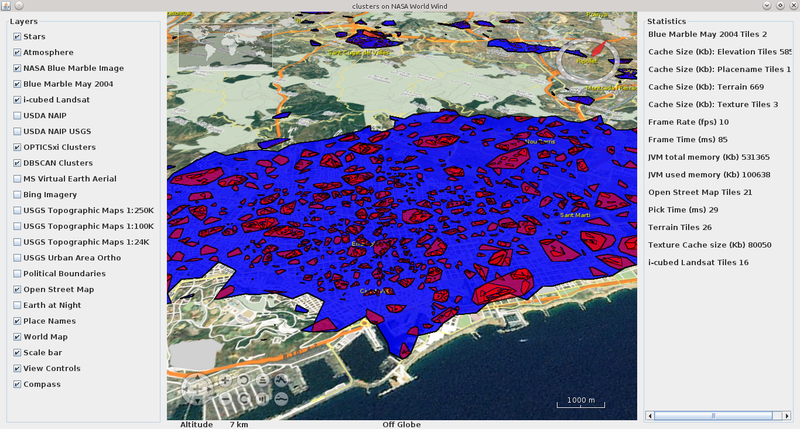 My PechaKucha talk at DataBeers : “Visualizing Geolocated Tweets: a Spatial Data Mining Approach”. Cluster explorer is a piece of software I was working on, which blends machine learning and GIS to produce a cluster visualization on top of a virtual globe. The virtual globe uses NasaWorldWind, a Java framework for 3D geo-visualization based on OpenGL, while the clustering algorithms use the ELKI Data mining framework for unsupervised learning. The tool allows to cluster a bunch of points (for instance geolocated Tweets) using one of two algorithms (or both), and explore the contextual information provided by the geographic layers (e.g. : OSM, Bing). This time I’m at the Workshop: “Data Visualization from Different Universes”, presenting some work regarding the visualization of Tweets, using a combination of machine learning and GIS. 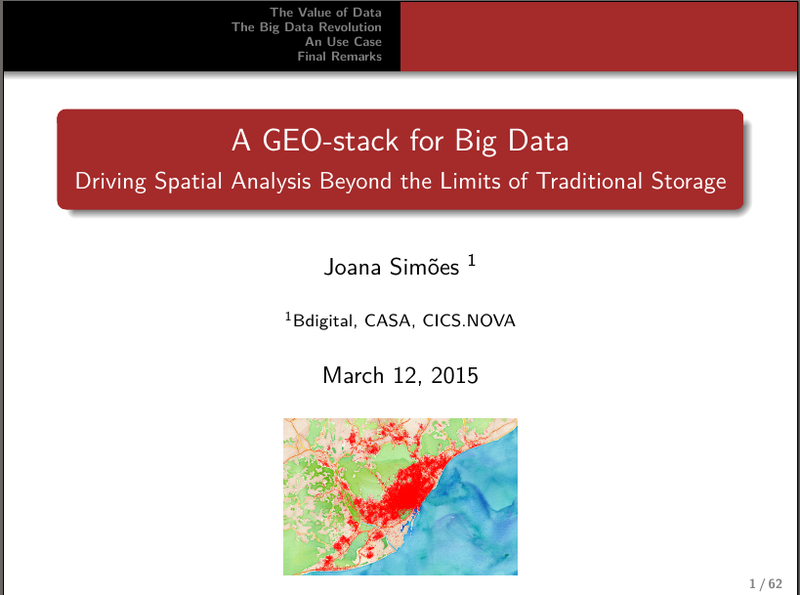 My presentation on the “Conference on Advanced Spatial Modelling and Analysis” consisted in some thoughts regarding Big Spatial Data, and how to handle them in terms of modern technologies. It was great to see such a motivated crowd from all generations, and to get to know the research developed by CEG, in topics such as Agent Based Modelling and Neural Networks. It was also great to talk again to Arnaud Banos, from the Complex System Institute of Paris Ile-de-France (ISC-PIF). Recently I had another challenge, which I believe has the characteristics to be a common problem. I have a table with attributes, in CSV format, one of which is geospatial. CSV is a structured format for storing tabular data (text and numbers), where each row corresponds to a record, and each field is separated by a known character(generally a comma). It is probably one of the most common formats to distribute that, probably because it is a standard output from relational databases. Since people hand me data often in this format, and for a number of reasons it is more convenient for me to to use JSON data, I thought it would be handy to have a method to translating CSV into JSON, and this was the first milestone of this challenge. This gave me a nicely formatted JSON output (the first milestone! ), but as you can notice the geometry is not conform with any OGC standards. It is actually a linestring, which is defined by a start point (StartLongitude, StartLatitude) and an end point (EndLongitude, EndLatitude). Once more, jq comes really handy to this task. Since the JSON converser parse all the variables into strings, it is important to pass a filter (tonumber) to make sure that the coordinate numbers are converted back into numbers. A lot of people and institutions have already made the jump of providing data in JSON, which is great, since it is an inter-operable standard and a semi-structured form of data. However when it comes down to geographic data, standards don’t seem to be so common. I have seen many different ways of encoding geospatial information within JSON, normally involving listing an array of coordinates, with or without name fields for lat and long. Rarely there is any CRS associated to this data (which could be ok, for the case that it uses WGS84), or any mention of the geometry type. This information is more or less useless, without some pre-processing to convert it into a “GIS-friendly” format, that we could use in QGIS, GeoServer, or even R.
Since we are dealing with JSON, the natural thing would be to convert it into GeoJSON, a structured format for geographic data. And the perfect tool for doing this is jq, a tool that I mentioned in a previous post. 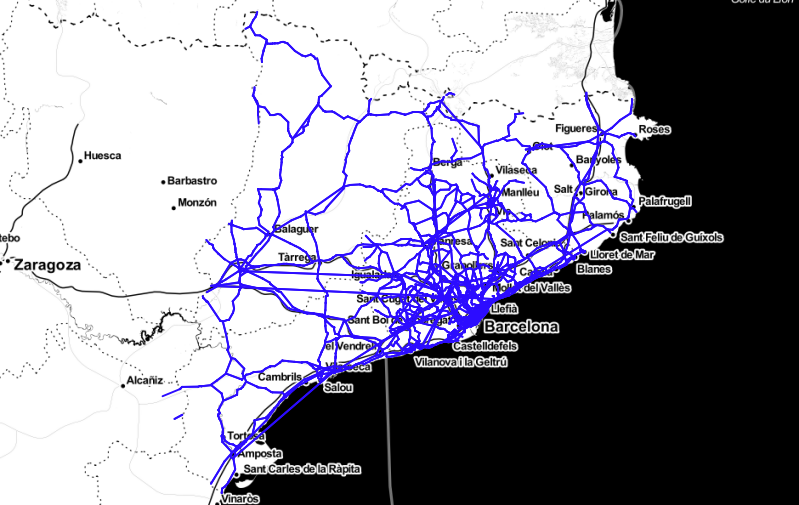 To make it simpler to understand I will explain what I did a specific JSON dataset, but with some knowledge of jq (and GeoJSON), you could literally apply it to any JSON dataset with geographic information within it. 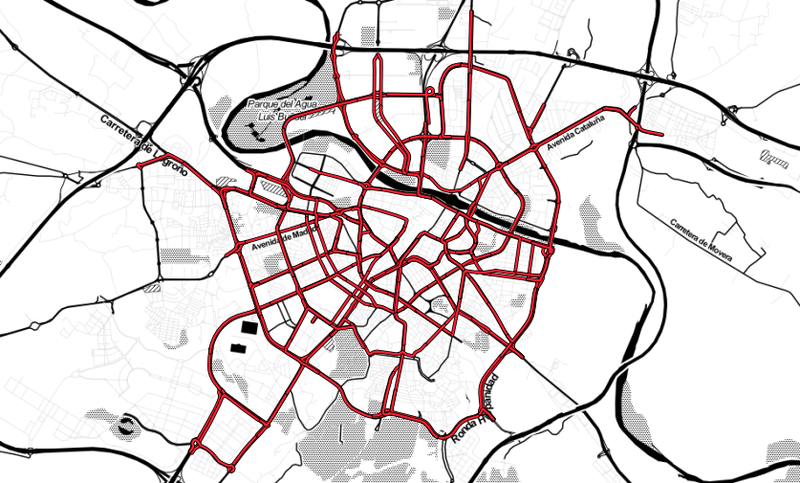 My test dataset was the description of a set of roads, from the city of zaragoza,. We are asking for the longitude and latitude coordinates of track 2, but since jq evaluates expressions from left to right, it will gives us back the array of longitude coordinates and the array of latitude coordinates, not the pairs. And then we need to do a few text manipulation operations, that I could not find a way of performing with jq. Basically we need to add the opening tags for the feature collection, commas between each object, and then add closing tags for the feature collection. Inspired by @jeroenhjanssens, author of the Data Science Toolbox, I decided to give a go to one of the most unfriendly data sources: An XML API. Apart from its rich syntax with query capabilities, I tend think XML is highly verbose and human unfriendly, which is quite a discouraging if you don’t want to take advantage of all its capabilities. And in my case I didn’t: I just wanted to grab a data stream, in order to be able to build some analysis in R. APIs are generally a pain for data scientists, because they tend to want to have “a look at things” and get a general feeling of the dataset, before start building code. Normally, this is not possible with an API, unless you use these high-end drag-and-drop interfaces, that are generally costly. But following this approach I was able to setup a chain of tools that enable me to reproduce this AGILE workflow, where you can have a feel of the dataset in R, without having to write a Python client. Having the JSON, it is possible to query it using jq, a command line JSON parser that I find really intuitive. With this command, I am able to narrow the dataset to the fields I am interested, and pipe the results into another text file. In this case I am skipping all the “headers”, and grabbing an array of elements, which is what I want to analyse. Now here I could add another step, to convert the JSON results into csv, but actually R has interfaces to JSON, so why not use those to import the data directly. There is actually more than one package that can do this, but I had some nice results with jsonlite. And with these two lines of code, I have a data frame that I can use for running ML algorithms. Together with a colleague, I have been involved in the “hard” task of drafting a diagram (or a “mindmap”) that would connect logically, some of the “buzz words” regarding “data science”; e.g. : artificial intelligence, machine learning, data mining, recommenders. Moreover we wanted to provide a classification that would organize the different “algorithmic families” into some sort of typology. Hard task, I know, mostly because there are many classifications, based on the approaches we want to take; e.g. : by learning method, by task. We ended up not with one diagram, but with two, separating “data mining” and “machine learning”, in order to explain them better. In the “Data mining” diagram, we include a general distinction between “descriptive” and “predictive” data mining, and within these two, we follow with sub divisions that finish in data mining techniques that may or not belong to machine learning (e.g. : statistics). On the bottom of the diagram, we represent the generic data mining applications, that make use of these techniques. One key difficulty in drafting this diagram is the fact that some techniques can include other techniques, and it is not easy to reflect that in the diagram. For instance, machine learning techniques typically make use descriptive statistics such as dispersion or central tendency. Clearly there is some degree of overlap between the two diagrams. Machine learning is part of Data Mining, and therefore some algorithmic “families” are presented in both diagrams. However we believe that in this way, it becomes easier to describe what “machine learning” is, as a scientific discipline, and how it “fits & mixes”, within the “wide umbrella” of data mining. 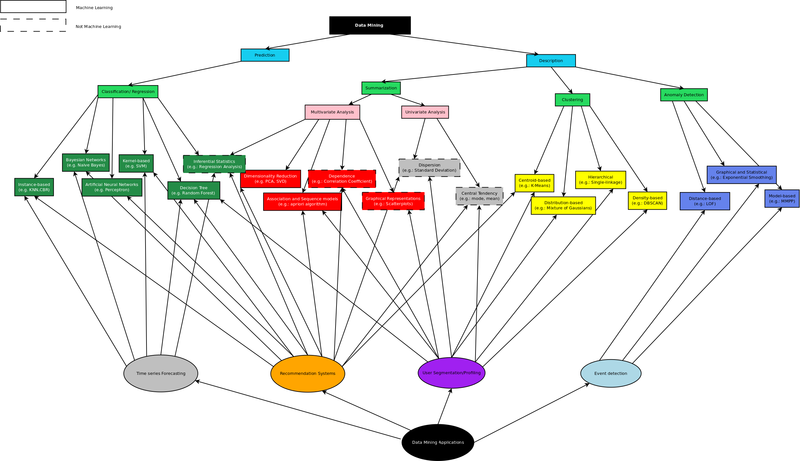 This diagram was based on a lot of reads (mostly blogs), on our own knowledge and a lot of discussion. It is not “written on stone”, and I don’t even know if it is possible to have such a thing, regarding a topic that is so difficult to classify, either because it is evolving so fast or because it is often very “fuzzy”. In any case, any (constructive) critics or commentaries regarding ways of improving these diagrams, or even just some thoughts would be greatly appreciated. Is PostgreSQL/PostGIS suitable for Big Data? This is a question I have been asking myself for a while, and I now have the opportunity to test it with a PostgreSQL instance from Amazon Web Services (AWS); after all, if such a service cannot deal with “Big Data”, who can? 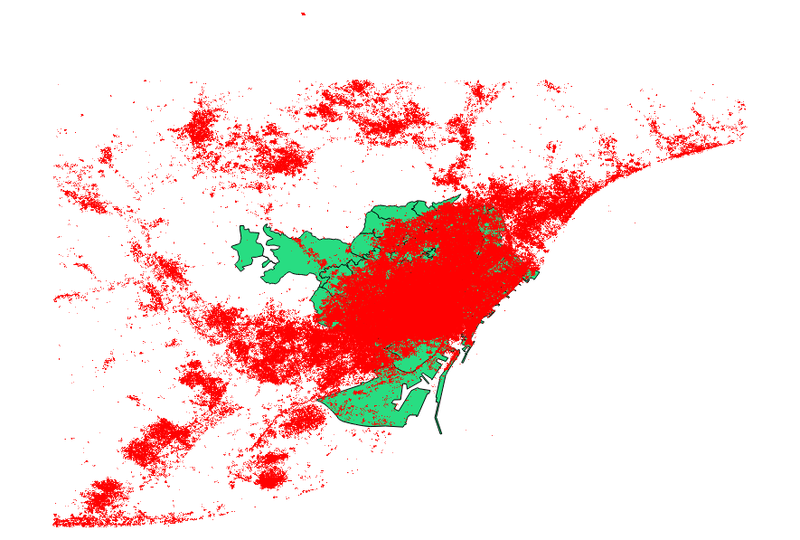 I have a dataset with Tweets in the city of Barcelona, over a time period. The entire dataset amounts to about 3 million points (82 MB), and I have some subsets: a smaller collection of about 2 million points (55 MB) and 300 000 points (8.2. MB). We can argue whether this dataset is, or not, Big Data; but IMHO, a table with more than 1 million records starts to get “heavy” for any relational database. Now before doing any computations of spatial algorithms (e.g. : convex hull, point in polygon), the very first step is to actually load this dataset into the database. And this is where I started to struggle. QGIS has a plugin called SPIT, that allows to import a Shapefile into PostGIS. Unfortunately it seems to be extremely slow any of the three files that I mentioned above (including the smaller one). 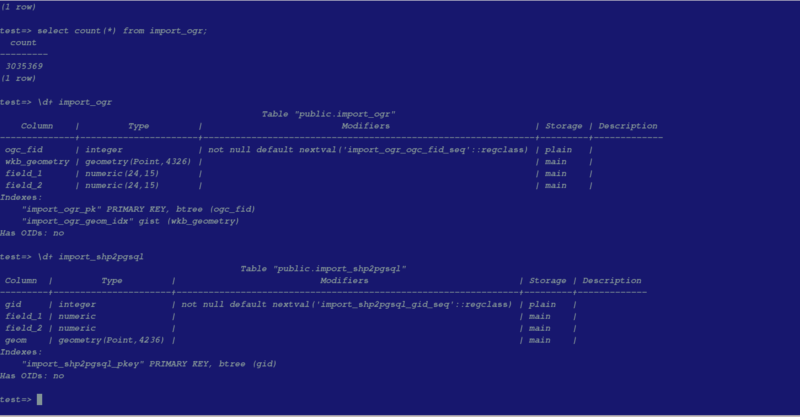 Switching to the command line, where I have more control knowledge about the processes that are running, I tried shp2pgsql, a tool for importing Shapefiles that comes with the PostGIS installation. Create an sql file with the insert statements. Load this sql file into the database. Unsurprisingly, the SQL file with the statements was generated quite quickly, and the processing effort was being spent on the insert queries. This situation was verified with the three Shapefiles, even when I inserted a spatial index (Gist). After thinking a bit, I came to the conclusion that the spatial index should be created within the “CREATE TABLE” statement, so it should actually speed up the queries a bit (but I did not confirm this guess). My next attempt, was to use ogr2ogr, the GDAL tool to convert between vector formats. I have to say that I read some suggestion to prefer shp2pgsql over this tool, and in fact it was quite slow as well (at this point I was only testing the smallest of the Shapefiles). Upgrade the PostGIS server (would scale vertically make any difference?). Upload the data into the Amazon server and run the import tool from there. I am not sure whether it is possible to do that, but it seems like a good improvement to do this operation locally, and using the power of the Amazon Server, rather than my desktop computer. 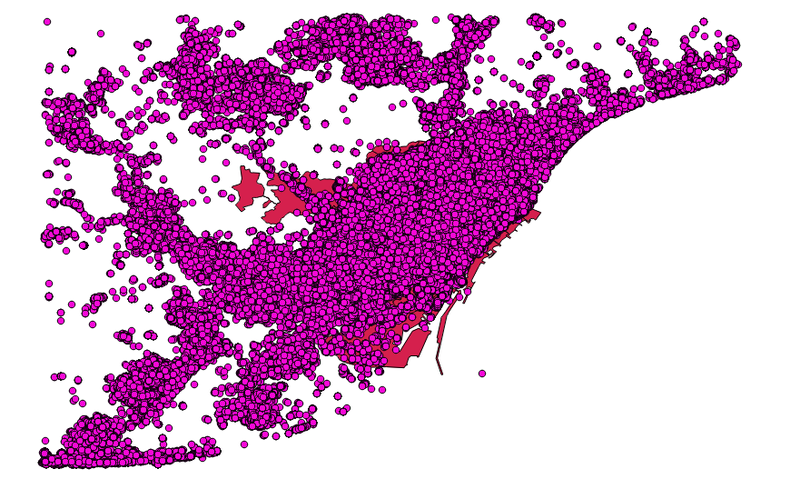 Split the Shapefile into chunks of data. I am not entirely sure how to do this, and any suggestions would be welcome. Next steps: once I manage to import a large Shapefile into my PostGIS instance, I will post some feedback about the computation of spatial operations. Update: Apparently I underestimated the fact that I am importing data over a network connection, with a limited latency. The best thing would be to make the import locally, an option that I unfortunately don’t have, since the Amazon RDS does not give me SSH access (it is a service, not a machine!). I decided to switch to a new approach: import a plain csv file into a database table, using the /copy command, and that was actually really fast (a few seconds). psql database -U user -h host.eu-west-1.rds.amazonaws.com -c "\copy newt_table from 'data.csv' with DELIMITER ','"
Of course, I then had to run a query populate the point geometry from the float (x,y) values, and create an update a spatial index (for a matter efficiency it is recommended that indexes are created after, and not during the import!). That was still considerably fast (although not as much as the csv import! ), and my guess is: it is because I are now running queries on the remote machine (and not uploading data via an internet connection). Following some very usefull on Stack Overflow, I decided to retry my previous approaches, tuning the configuration parameters. Although speed has improved massively, it still took me 1:03:00 to run this query. Comparing the two imports, we can see that shp2pgsql did not create any index (which we already commented is a costly operation), while ogr2ogr created a gist index on the spatial field. The extra step of creating an index, has to be added to the shp2pgsql import, but as we have seen before, that operation is not a problem since we are then operating on the server. I conclude this review, stating that shp2pgsql has a great performance in the task of loading a Big Data spatial table into a remote PostGIS server (e.g. : Amazon RDS). It is recommended that the “-D” flag is passed to the tool, and that no indexes are created during this operation.